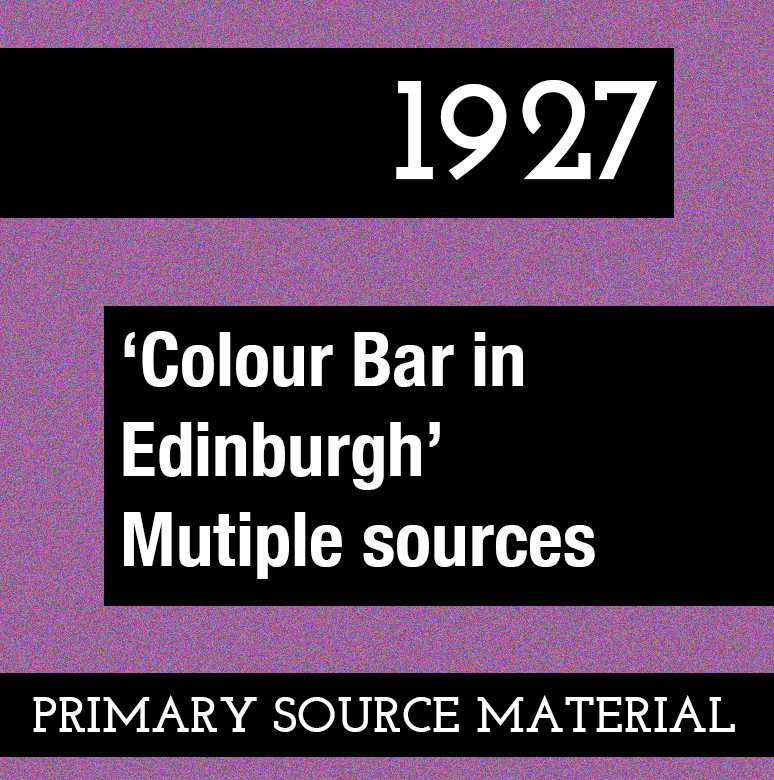 Primary source material reproduced from: ‘Colour Bar in Edinburgh’, The Scotsman, 21/05/1927; ‘Colour Bar in Edinburgh’, The Scotsman, 24/05/1927; ‘Colour Bar: Edinburgh Case: Ventilated in Commons’, The Scotsman, 01/06/1927; ‘Fatuous Scots Clerics’, Umteteli wa Bantu, 04/06/1927; Sol Plaatje, ‘The Social Colour Bar’, Umteteli wa Bantu, 18/06/1927; ‘Indian ‘Ban’ Removed’, New Leader, 01/07/1927; Sumita Mukherjee, Nationalism, Education and Migrant Identities: The England-Returned, Abingdon, 2010, p.59; Ali Wardak, Social Control and Deviance: A South Asian Community in Scotland. In my opinion you should be very grateful to these proprietors of the dance halls for what they have done. I am sure that all Indian fathers and mothers will be only too glad to have their sons excluded from dance-halls – places where they are liable to make undesirable acquaintances. These letters were insulting, not only to the Indian community in Edinburgh, but to the Indian nation, and to all the ‘coloured races’ in general. One more dance hall and one more restaurant, while they have refrained from giving us anything in writing, have sent us verbal message to the same effect […] Though the decisions of these dance halls and these restaurants do not materially affect us in so far as most of them have never been frequented by many of our members, nevertheless we have keenly felt the humiliation and the spirit of racial hatred involved in their attitude towards us. While were are doing, and are contemplating to do, everything we can to counteract the attack made on our national pride and honour by the dance halls and restaurants, we feel it incompatible with our sense of self-respect to take any part in the public demonstration of any sort in Edinburgh so long as the decisions of these places of public entertainment remained unprovoked, or as long as the general public of Edinburgh does not demonstrate in some way its disapproval of such behaviour on the part of the managers of these places. Newspapers in India were outraged. Forward, a Swarajiist organ in India, denounced the “inhuman persecution and indignities” of Indian students in Edinburgh. New Leader, the newspaper organ of the Independent Labour Party (ILP), reported that the “immediate response” in India, “was the introduction of a resolution in the Calcutta Corporation to exclude Scotsmen from its employment and to levy a special rate on Scotsmen living there!” Britain’s only Communist MP, Shapur Saklatvala raised the issue in the House of Commons, demanding that Edinburgh councillors “put an end to an extremely obnoxious practise”. We entirely agree that the social admixture of black and white, whether in Scotland, South Africa or elsewhere, should be strictly forbidden, and we are glad to discover that British public opinion on this subject is drawing nearer to the opinion firmly held by every decent-minded, self-respecting Native in South Africa. In our opinion the protest of Scots clerics is wholly fatuous, and we shall be grateful if readers will express to us their views on the questions: ‘Should white men dance with black girls, or black men with white girls? Should there be social intermingling of the black and white races? Sir, I was pained to read in the current number of ‘Umteteli’ an invitation to your Native readers to discuss the Edinburgh ban on non-Europeans at restaurants and dancing halls […] Personally I hold no brief for Scottish missionaries, but I feel certain they would have taken no notice of the ban if it were confined to the dance halls. But the exclusion embraces restaurants also and the fact that Auld Reekie cannot boast a ‘Kafir Eating House’ probably influences the Church Assembly in the step it took. Let us not forget that only Princes Street runs between a restaurant and the University and when the colour bar extends from the eating house to the University, Scotland’s great mission, ‘From Greenland Icy Mountains, to India’s Coral Strand’, will be almost at an end. When that day dawns the Transvaal Nationalist members of Parliament will justly be constrained to despatch another congratulatory telegram to another body in a city ten times as distant as Mafeking. 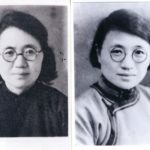 […] The social intermingling of white and black races is a topic pregnant with opportunities for wholescale miscontruction, and the criticism of missionaries in an accredited Native organ will do nobody any good. The ban appears to have been dropped after a joint delegation of Indian, Sri Lankan, Caribbean and African students visited the Lord Provost at the City Chambers and the ‘Imperial Committee’ of the Independent Labour Party petitioned officials. 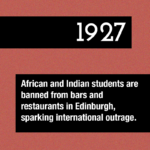 NEWER1927 – Students of colour are banned from bars and restaurants in Edinburgh, sparking international outrage.